Thirty minutes is the minimum amount of exercise that the American College of Sports Medicine recommends on most days of the week, and it’s convenient to fulfill that quota by hopping on the treadmill. Whether those sessions will help you effectively lose weight, however, depends on a number of factors. If you spend your half hour walking at a leisurely pace, your workouts aren’t likely to help you lose weight, but moving more rapidly burns more calories and can make a bigger difference. According to Harvard Medical School, 30 minutes of walking at 3.5 mph burns about 149 calories for a 155-pound person, while jogging at 5 mph burns about 298 calories. Heavier people burn more calories than lighter people, so if you’re overweight and are just starting a treadmill workout program, you might notice faster results than a smaller person would. For example, if you weigh 185 lbs. and you jog on the treadmill for 30 minutes at 5 mph, you’ll burn about 355 calories. Many treadmills are programmed with options that allow you to control the intensity and cycles of your workout. The default setting allows you to run on level ground, but if you increase the incline of the machine, you’ll simulate running uphill, which burns more calories because it adds an element of resistance. In essence, you can lose weight with the treadmill’s help if you end up consistently burning more calories than you consume. 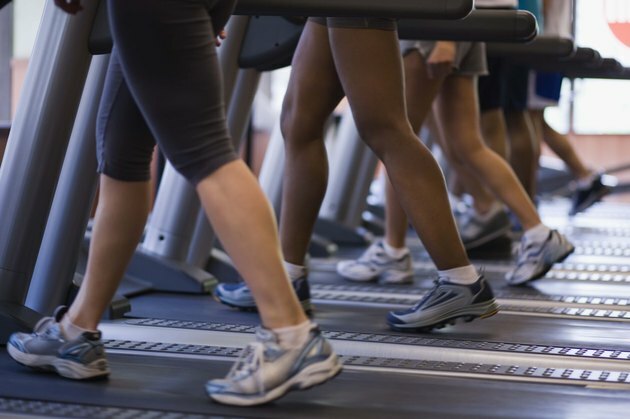 It may be easiest to do that through a combination of following a reduced-calorie diet and putting in regular treadmill sessions, but if you feel you tend to eat more calories than you need and you’re not willing to compromise on your diet, you may need to put in longer or more intense treadmill workouts to see weight loss. If you eat about as many calories as you burn each day and the treadmill is your only weight-loss strategy, you’ll gradually lose weight at a rate dependent upon how many calories you burn on the machine. So, for example, if you burn 300 calories in your 30-minute workout and you use the treadmill five times a week, you’ll lose close to 1/2 lb. per week or about 3-1/2 lbs. in two months.